The Final Transition From RSD We are delighted to announce that Rainsford Mann Design (RMD Marine) has now made its final transition from RSD Ltd and has been trading as the new entity from June 2009. With its 2 sister design consultancies RMD-Air and RMD-Land in support, RMD is now well placed to offer clients its continued expertise in yacht design projects but now also provide the same level of service for land based and aviation interior projects as well. As a result the team at RMD has grown with the recent arrival of 2 design consultants skilled in aviation interiors and yacht design respectively. RMD looks forward to a busy and productive time ahead under the stewardship of Managing Director Rupert Rainsford Mann. We expect to make a full and formal announcement with a press release at the end of April 2009. RSD has signed an agreement with ICON Yachts of Holland to take their hull platform and develop the next profile in the ICON range. The expectation for this project is to complete the design by July this year to enable a launch at the Monaco Yacht Show 2009. The attendance of RSD at METS in November culminated in a very satisfying result when we signed a new contract to collaborate on the design of a 27.5m wave-piercing catamaran Tatami for a client in Egypt. The 43-metre motoryacht Renegade is currently undergoing her third and most extensive refit in just over a decade, this time under the direction of the Rainsford Mann Design team. 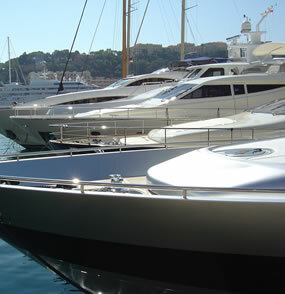 RSD enjoyed another successful Monaco Yacht Show this year - still the biggest and best superyacht show in our calendar. Rainsford Saunders Renegade refit The 43-metre motoryacht Renegade is currently undergoing her third and most extensive refit in just over a decade. RSD on the road Looking back at this year’s Dubai boat show, it was as always a great event, with both exhibitors and visitors coming away impressed as usual by the efficient organisation and pleasant setting of the event and the wide range of goods and services on offer. In 2007 RS Eden completed a major rebuild in conjunction with RSD, she has now completed her first full year since her relaunch. RSD has signed a contract to design two 85-metre superyachts for a Far Eastern client. RSD is delighted to announce that it has been shortlisted for the Best Newcomer of the Year category in the 2008 World Superyacht Awards organised by Boat International magazine. The autumn show season has been as busy as ever, with RSD exhibiting at the world’s two leading superyacht shows - the Monaco and Fort Lauderdale Boat Shows. Announced in September 2007, the refit of the 140-feet (43-metre) Renegade presents an array of challenges to the Rainsford Mann Design team. One of the most challenging refits to be undertaken anywhere in recent years, the transformation of the 49.5-metre 1930s classic Fulmara into R/S Eden was finally revealed to the world in the summer of 2007.